Visting L.A.? Check out my list of THINGS TO DO IN LOS ANGELES! After decades of sharing my knowledge of L.A. with friends and friends of friends in search of my city's best, I decided to use the one-to-many power of the internet to offer my suggestions to anyone who may be interested online . You can use this section of my website to learn more about Los Angeles, and discover some of the city's hot spots, from an L.A. native's perspective. I grew up in Los Angeles, and have lived there most of my life. L.A. gets a bad rap from a lot of people, and here's my theory why. L.A.'s a very big, vast sprawling place. When I say L.A., I'm not referring to Los Angeles County though, I'm referring to the actual City of Los Angeles, which is big, but not nearly as big as the county. The city does not include Anaheim, where Disneyland is or Burbank, where Universal Studios is. They're both fun place and I love them. But they're not in L.A., so they're not included in my itineraries. 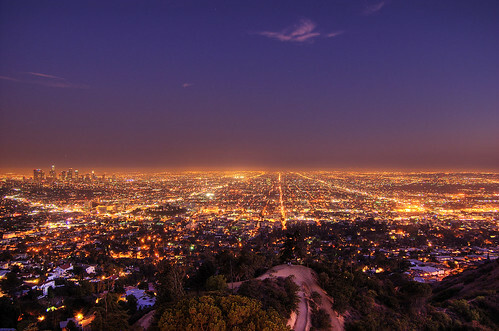 Los Angeles is not the type of city where you're likely to stumble into a great restaurant or a cool night spot. You need to know where you're going, you probably need a reservation and may need to be "on the list." Traffic in Los Angeles during rush hour is grueling. There's no public transportation worth a damn and relying on cabs is prohibitively expensive. You're going to need car. And most importantly, you're going to need to plan out your days to avoid getting stuck in gridlock. These lists include many of my favorite places, restaurants and points of interest in Los Angeles. I've organized special events for clients at some of these venues, but they're also the places I go when we want to have a little fun. Things to do in Los Angeles - Maps with suggested spots to visit in Los Angeles, as feature in the Amateur Traveler Podcast. Best Restaurants- Where are the best place to eat in Los Angeles? Chances are, you won't find out about these top eateries from your concierge or tour book. Best Dive Restaurants - Where are the best dives to eat at in Los Angeles? These are absolutely, unequivocally the best. Best Golf - Which are the best public golf courses in Los Angeles? Click here to find out where to go for 18-holes in and around Los Angeles. Night Spots- Where are the best place to hang, meet interesting people and party in Los Angeles? These the best watering holesthe City has to offer. Best Places to Launch - Want to stage an event in Los Angeles? If it isn't at the right location, it may not be as successful as you'd like. These are some of our favorite special events venues.